Customer experience especially in the digital context is one of the most important topics now and for the future. The importance of easy usability, fast services and personalized content grows steadily and is addressed by many players. Now Google tested a new rating feature for Hotels, which takes these trends into consideration. The feature shows reviews for Hotels based on the type of traveler. For example, search results are categorized by “Couples”, “Families”, “Solo” or “Business”. This means that customers can much faster identify the rating of the Hotel they would like to book, based on their specific needs and personal preferences. Therefore making the search and booking process a lot easier and more user friendly. Hotels can use this new feature to advertise to their targeted customer groups more specifically. 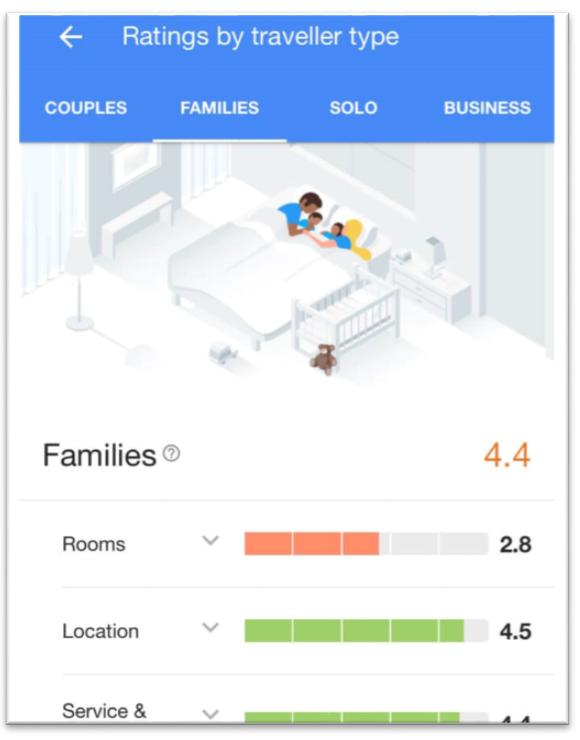 For example, a Hotel which has high ratings for families, as shown in the screenshot above, will much more likely want to attract families rather than business travelers. If this concept sounds familiar to you, you might have been reading recent posts in this Blog or visited the MySmark website, because MySmark uses almost the same traveler types on its Combi Action Button. With options like “Solo”, “Family”, “Couple” or “Friends”, the Combi Action Button makes it possible to personalize search results, improve the customer experience and much more benefits. Of course there is the possibility to change the traveler types used for the Combi Action Button. The four categories could be anything the client would like to have, always individually tailored to the customer´s needs. Google shows with the test of this new rating feature for Hotels that the basic concept of the Combi Action Button is cutting-edge and a customer experience tool of the future.